Is your company looking for qualified, talented technology professionals to fulfill technology recruiting and staffing needs? Perceptive Recruiting would love to hear from you. At Perceptive Recruiting, our priority is building relationships that last, working with both companies and individuals seeking new employment opportunities to ensure that the right person is found for the right job at the right time. 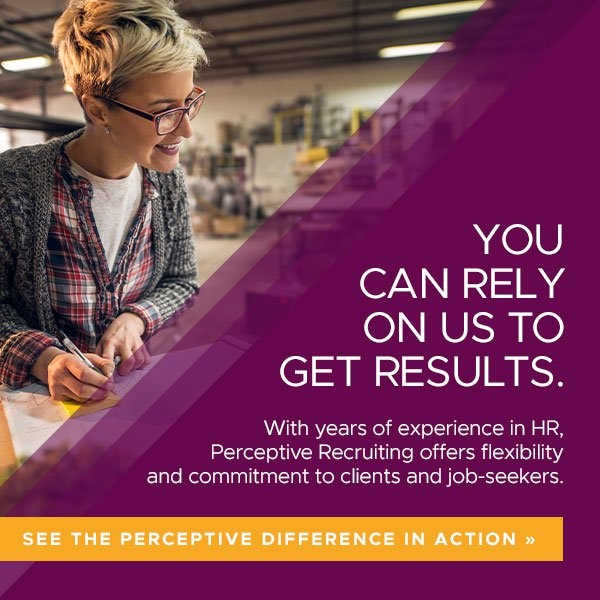 We believe in the Perceptive Difference — leveraging our decades of experience hiring for technical staffing needs at organizations of all sizes into unique insight and flexibility, including a streamlined process involving in-depth interviews, detailed background and drug checks, and time invested in ensuring candidates not only match the experience needed, but also are a good fit for the company culture. This form is for employers looking to discuss our technology recruiting capabilities. If you are a job seeker, please click here to send us your résumé. Perceptive Recruiting’s focus has long been on IT staffing in Greenville, SC. As a woman-owned company locally owned and operated right here in Greenville, we are uniquely positioned to provide technology staffing solutions for South Carolina organizations searching for individuals whose expertise, knowledge, and experience will allow them to excel in their new careers. You can contact us by phone at (864) 256-0203 with any questions or contact us online at any time at the form above.